Steve Moss has been regulating and repairing harps for over twenty years. During his eight years with Lyon & Healy, he trained and worked with Master Regulator Peter Wiley. Steve oversaw the company’s lever harp production for two years before moving into pedal harp assembly and regulation. He also specialized in training new employees and visiting apprentices. As a traveling technician, Steve has serviced harps in the Midwest and across the country. Recent clients include the principal harpists of the Milwaukee Symphony, the Omaha Symphony, the Toledo Symphony and the Utah Symphony, as well as the University of Michigan , Eastman School of Music, Northwestern University , Brigham Young University, the University of Utah, and the University of Toledo.He makes frequent regulation trips to Lyon & Healy West in Salt Lake City. 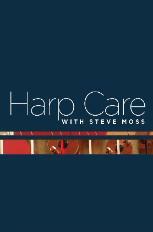 Steve is the author of Harp Care with Steve Moss, the first instructional DVD on harp maintenance, covering tuning, string replacement, cleaning, and moving of pedal and lever harps.